Axle and Bird are back from the dead. No longer merely human, they must now work to further the oohaate-the spirit path. Whether they will like what they find at the journey's end remains to be seen, but for now, there's no turning back. An explosion at Windslow Mine has set things in motion. The forest is crawling with snakes, driven from their nests by underground fires. And the snakes are not alone. Other forces are emerging, rising from the earth's molten veins, preparing to reclaim a smoldering world. By daybreak, the residents of Windslow, Pennsylvania, will know that the world is burning beneath them. By daybreak, the nightmare begins. 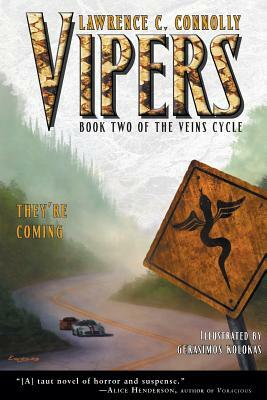 VIPERS is the sequel to Lawrence C. Connolly's critically acclaimed debut novel, VEINS.